As Dropout Nation hinted on Wednesday, there is nothing just or moral about the decision by a New York City grand jury to not indict police officer Daniel Pantaleo for the murder of Eric Garner. As with last week’s grand jury decision in Ferguson over Michael Brown’s slaying, we have all been rudely reminded that state-sanctioned murder of black men is at the heart of the racial bigotry that is America’s Original Sin. Just as importantly, we are once again warned about the consequences of militarizing law enforcement agencies as well as giving them too much carte blanch in how they patrol our communities. Yet one of the more-positive developments from the Garner grand jury’s appalling act of injustice is that it once again shines light on how state laws and the cultism among those wearing the badge often act to protects corrupt, even murderous police officers from being removed from beats. School reformers and criminal justice reform advocates can come together to help each other get rid of professionals who shouldn’t be trusted with our kids or with protecting our neighborhoods. The fact that Pantaleo managed to escape even an indictment on a lower level charge such as manslaughter or criminally-negligent homicide is certainly shocking. This is because 83 percent of 98 homicides by officers led to charges of murder or manslaughter, according to a recent study from Bowling Green State University. But even if Pantaleo was indicted, past cases of homicide-by-cop — including the 2006 murder of Sean Bell by a New York Police Department undercover squad who mistakenly thought he was a suspect in a case they were investigating — serve as grim reminders that he (along with former Ferguson police officer Darren Wilson) wouldn’t have likely been convicted. Just one-in-three officers charged with a crime were convicted while a mere 12 percent of them (or one-in-eight) ever served time, according to data released in 2010 by the Police Misconduct Reporting Project; both are, respectively, two and four times lower than for indicted suspects in the general population. Certainly the natural sympathy among the public outside of black and Latino communities for what can be dangerous work of policing is one reason why bad cops such as Pantaleo and Wilson are often allowed to kill with impunity; even though the number of cops slain in the line of duty (along with other crimes) have declined for most of the past three decades (and are at their lowest levels in more than a century), it is easy to understand why officers will have to pull out their weapons in order to protect communities and themselves. 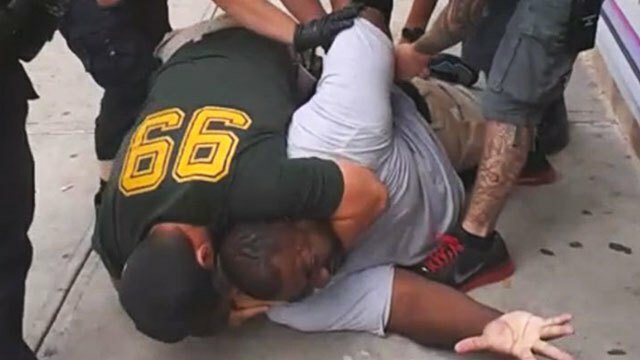 But as the reaction of even more law-and-order oriented movement conservatives such as New York Times columnist Ross Douthat shows, even those sympathies fall by the wayside when video clearly shows an unarmed citizen such as the 43-year-old Garner being choked to death by Pantaleo with so much malice. Add in the video of Cleveland police officer Timothy Loehmann shooting to death 12-year-old Tamir Rice for playing with a toy gun, and the trust that the legendary Sir Robert Peel argued was key to support for law enforcement falls away. But the more-important reasons why bad cops get away with corruption or worse have to do with state laws and court rulings, police evaluation structures that fail to weed out bad apples, and the proverbial thin blue line of silence (and support) from fellow police officers who are often willing to defend even the worst of their allies. Beginning in 1985 with the U.S. Supreme Court’s ruling in Garner v. Tennessee, state laws such as Article 35 of New York State’s Penal Code and Chapter 563 of the Missouri Revised Statutes have given officers wide leeway in how they use deadly force in stopping criminal activity. Officers can shoot to kill if they “objectively reasonable” probably cause to “believe that the suspect poses a significant threat of death or serious physical injury to the officer or others”. The problem is that it is almost impossible to determine what is objective or reasonable, and thus, objective becomes subjective and unreliable. More often than not, if a police officer says he fears for his life (as Wilson did in his testimony to the St. Louis grand jury), than he is let off the hook. Since state laws rarely require the objective standard to be based on physical evidence, even a videotape isn’t enough to lead to an indictment, much less a conviction. Bad cops such as Dan Pantaleo, who murdered Eric Garner, destroy communities. Then there are the shoddy processes for selecting police officers and evaluating their performance. Police departments generally use a process that includes filling out a job application, passing a physical, going through criminal background checks, and polygraph examinations. When done properly, this process can weed out aspiring officers who are too out-of-shape to chase down robbers on foot or have past convictions; when not, (as seen in Miami during the Cocaine Cowboys crime wave era of the 1980s), this can lead to spectacular corruption. But it doesn’t actually do much to determine if they have the proper temperament and judgement needed to do the job. This is especially problematic in community-oriented policing, in which officers have to be trusted with making short- and long-term judgments on their own. Adding further complication is the reality that police officers often view themselves as bands of brothers who will protect each other even at cost to the integrity of their profession. Famed police detective Frank Serpico — who carries a bullet in his head as a result of his decision to shed light on the Big Apple’s drug war-driven police corruption in the 1970s (which led to the famed Knapp Commission cleanup of the police department) — forcefully pointed out this reality in a piece on Ferguson in Politico Magazine. Not only will officers do nothing to help weed out the worst (and even merely bad) within their ranks, they will shun (and even endanger) those few brave officers who dare to break the Blue Wall of Silence. This was clear Wednesday after the Garner grand jury decision to not indict Pantaleo, when participants on one police bulletin board cheered it. As seen in the cases of Pantaleo and Wilson, prosecutors mindful of the importance police union endorsements in winning and keeping office (as well as maintaining an image of being tough on crime) will often do all they can to not obtain indictments or convictions. 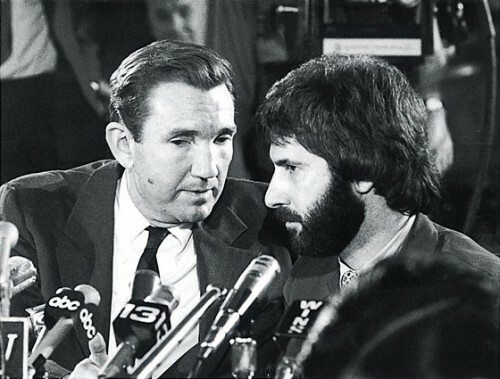 Particularly in the case of St. Louis County Prosecuting Attorney Bob McCulloch, his, well, unorthodox approach to presenting his case to the grand jury investigating Wilson’s murder of Brown has been widely criticized for essentially making it easy for the now-former officer to walk away scot-free from human justice. As a result, few bad cops ever get sacked. Just 1.9 percent of NYPD’s men in blue were dismissed between 1975 and 1996, according to a 2005 study by James Fyfe of City University of New York’s John Jay College and Robert Kane of American University. Those who remain on the job can often end up walking the beat even in the departments where they committed offenses. Michael Carey, one of four officers who shot 41 bullets into the body of Amadou Diallo in 1999, got his gun back to patrol Big Apple streets just two years ago. For all citizens, especially for poor and minority communities with long memories of state-sanctioned murder, the presence of bad cops means immediate danger to their lives and civil liberties. If any of this sounds familiar to those of us in the school reform movement, it should. Because the ways bad cops are protected and enabled are parallel to how American public education keep laggard and criminally abusive teachers in classrooms. As Frank Serpico would say, there are few differences between the Blue Wall of Silence and the Thin Chalk Line. As with laws governing deadly force, state laws granting near-lifetime employment in the form of tenure all but ensure that teachers remain on the job regardless of performance. Thanks to the fact that all but eight states allow teachers to attain tenure in less than five years — and in the case of California, within two — laggard teachers end up getting into jobs regardless of their performance. Adding to the burden are teacher dismissal laws such as those of California (which can cause firing processes to last seven years and cost a district as much as $7 million), that make it difficult to toss even the criminally abusive out of classrooms. Just like police departments, the nation’s university schools of education do a shoddy job of recruiting and training aspiring teachers. As your editor noted last month, this was made clear again by the National Council of Teacher Quality in the latest of its reports on the low quality of ed school preparation. Thanks to both bureaucratic incompetence as well as state laws that have, until recently, restricted the use of test score growth data in teacher evaluations (and have only allowed subjective observation-based evaluations that don’t actually measure how teachers improve student achievement), districts have failed miserably in evaluating and managing classroom instructors. Just 40 percent of veteran teachers and 70 percent of new hires were evaluated by Los Angeles Unified School District during the 2009-2010 school year, according to NCTQ in a 2011 report. Meanwhile the cultism that pervades police departments can also be found in teachers; lounges in traditional public schools. Like the Blue Wall of Silence, the Thin Chalk Line not only keeps good and great teachers from calling out the incompetents in their midst, it (along with near-lifetime employment) also lead otherwise-honorable teachers to protect the criminally-abusive among them. This was clear in the sexual abuse scandal still enveloping L.A. Unified; former Miramonte Elementary School teacher Mark Berndt’s “lewd conduct” against children in the school went unreported by his colleagues. In some cases, teachers will even defend the worst apples among them. One example can be seen in Rochester, N.Y., where teachers at School 19 failed to cooperate in the investigation of Matthew LoMaglio for second degree sexual misconduct against an eight-year-old boy, then wrote letters to a judge begging for leniency on his behalf. But as with the Blue Wall, the Thin Chalk Line extends beyond teachers’ lounges. Thanks to affiliates of the National Education Association and the American Federation of Teachers, removing laggard and criminally abusive teachers can be too onerous for districts to undertake. Because the two unions are the biggest players in school board races and, thanks to state laws, can force districts into bargaining, they have worked closely with administrators to structure contracts that keep principals from removing laggards or stop those with seniority from bumping out better performing-yet-less senior counterparts. At the same time, low-performing school leaders in school buildings, who couldn’t even get jobs checking coats at a Ruth’s Chris Steakhouse, often do such a terrible job of managing teaching staffs as well as even aid and abet laggard teachers through practices such as overusing harsh school discipline. As a result, few laggard and criminally-abusive teachers are ever tossed out of classrooms. In New York City, cases such as that of Steven Ostrin, who was found guilty of sexually harassing students, yet he was only given a six-month suspension and a reprimand, have become commonplace. Overall, just 1.4 percent of tenured teachers were removed for poor performance, while less than seven-tenths of one percent of newly-hired instructors are ever fired. And like bad cops, bad teachers damage the futures of communities, especially those black and brown, and the lives of the children who are forced to sit in their classrooms. Criminally-abusive teachers such as former L.A. Unified instructor Mark Berndt do as much damage to children as bad cops do to their families. But unlike criminal justice reformers, school reform advocates can say that they are making some headway on addressing teacher quality issues. From the teacher evaluations using objective test score growth data in measuring performance, to efforts such as the lawsuits inspired by the Vergara v. California (in which a state court judge tossed out the Golden State’s tenure and dismissal laws), to efforts by districts such as New York City to aggressively evaluate newly-hired teachers before they attain tenure, small positive steps are being made to provide all children with the high-quality teachers they deserve. What this means is that reformers can team up with criminal justice reform advocates are share lessons on how to address their parallel issues. After all, reformers have taken some of the more-successful aspects of policing — including the development of early warning systems based on the Broken Windows Theory used to great success in the Big Apple — in systemic reform efforts. More importantly, it is important for reformers to be concerned about what happens outside of schoolhouses, especially since the nation’s education crisis fuels the crises that happen daily on our streets. Just because criminal justice reform isn’t a primary focus of transforming public education doesn’t mean it shouldn’t be a concern. One way school reformers and criminal justice reform advocates can work together is on police recruiting and training. Criminal justice reformers, for example, could apply some version of the teacher recruiting model developed by Teach For America, which has not only helped provide kids with high-quality teachers, but has also led to diversity in the teaching ranks. One can imagine how a Teach For America-style corps for police officers could help stem police brutality as well as build trust between law enforcement agencies and black communities. The Garner grand jury decision, along with that in Ferguson, once again offer reformers an opportunity to stand up and be counted for the very communities of the children for who we advocate. Sharing lessons with counterparts working to end police corruption and brutality will help our kids and their families outside of classrooms as well as in them. Public policy by ‘custom’ grants police power to kill and to commit other crimes.